Saturday’s crew after 1000 reps of work on teams of 4. Great group and it’s growing weekly. Soon there will be two classes on Saturdays. Yeahhhh buddy! CrossFit CrownTown will be closed on Thursday for Thanksgiving. Friday we will have one class and Saturday we will have the normal 9am class. The time for Friday’s class will be announced by Wednesday. 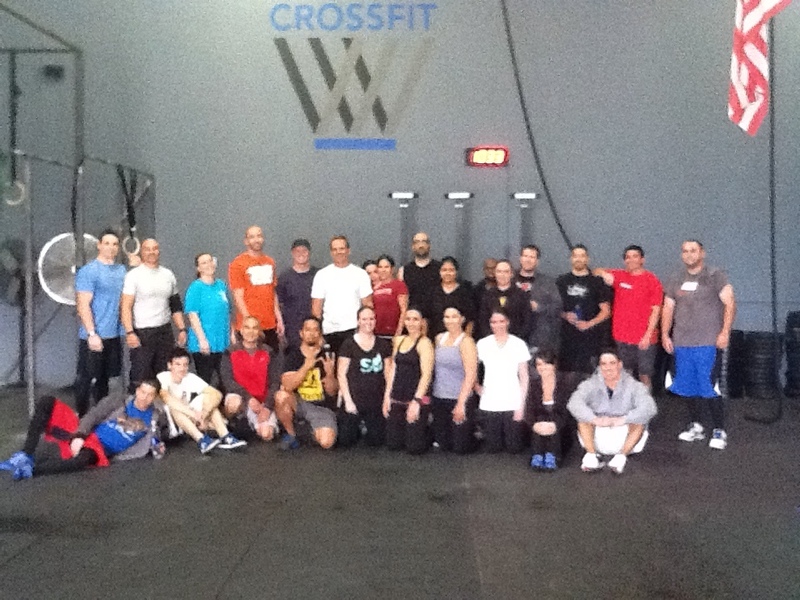 WW will be getting a CrossFit Endurance Certification on December 3rd-4th in Orange, CA. What this means to you is better coaching in running mechanics (this is huge), a future CrossFit CrownTown Endurance program and an Endurance Team. All good stuff! ***ATTN*** The gym is participating in a holiday program to support our troops. Camp Pendleton Marine Corps Families Secret Santa Program. 1200 families of E-5 ranked Marines or lower. Some are deployed, but all are in need of some help around the holidays to make sure their families have a Merry Christmas. Toys and/or gift cards are best. $10 is the least we can do to show we are thankful for them putting their lives on the line for our freedom. We will be providing a giant gift box at the gym. Bring your contributions to the gym by December 9th. CrownTown will bring the gifts to the December 10th NLI, where the individual handling the delivery to the Marines will be. Let me know if you have any questions. December 17th, 2011 – Grand Opening & Member Appreciation Celebration. Location and details to follow. January 14-15, 2012 – The OC Throwdown. Two day competition that WW is competing in. He qualified for the Elite Division where he will be competing against three CrossFit Games competitors along with many other legit athletes from all over. This will be a must see event.